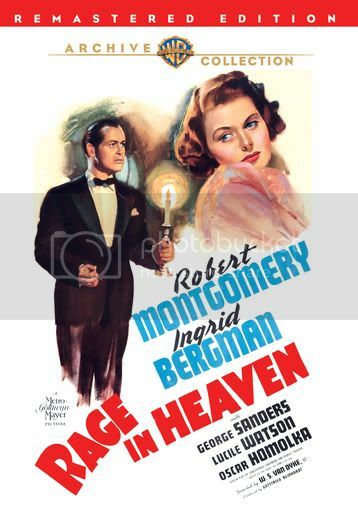 Props to the Warner Archive for releasing another Bob movie on DVD: Rage in Heaven. Its a bit quirky (dead kittens, full moons and all), but its also an entertaining watch after a long day. I've been super busy with life lately, so I've been asking around for guest bloggers to help keep things rolling on the blog. With today's post, please welcome fellow Bob fan, Kathy! I've taken on the somewhat daunting task of putting my Bob photos into some kind of order for my Photobucket album. They're not all mine (unfortunately), many are from Carrie's great blog, others from everywhere on the net that comes up when I Google Robert Montgomery. 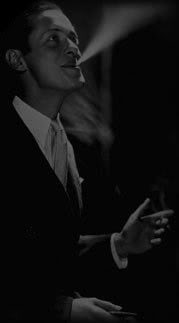 There are quite a few photos out there, but few are identified...at most a "1930's" tag, not much help since most of his photos are from that decade. Okay, enough of a preamble to set up my following discovery, a "Voila!" moment for me. Lets start with this photo of Bob and a group of fans, displayed previously on this blog, but worth showing again...cuteness abounds. But no details...none. 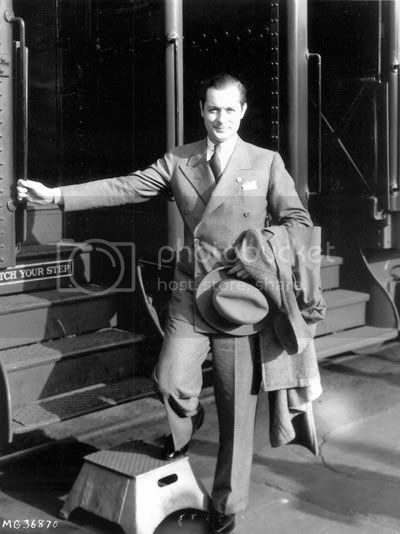 Note Bob is dressed to the nines, wide-breasted suit, the hanky just so, tie and lapel pins, carrying his hat and overcoat, and all on a bright summer day, based on the summer frocks the girls are wearing. Now we switch to a more typical Bob photo --- Bob about to embark upon another trip to New York or beyond. Great outfit...hey, it sure looks like the same one as in the previous picture, even down to the small lapel pin. And no further information about the photo, of course. 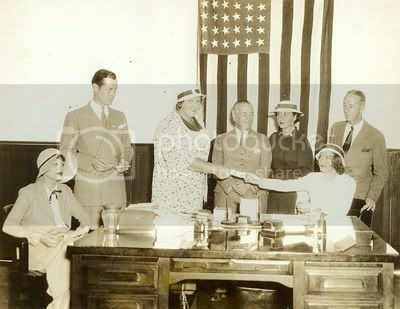 Lastly, a photo, amazingly enough, with a complete description and dated August 29, 1933: "Star-Spangled Support for the NRA (National Recovery Act) Drive!...stars signing up at the post office for the NRA Consumers Drive." That's Kate Smith handing Nancy Carroll a form to fill in. And Bob (a New Deal Democrat, at the time) looking on, wearing the same outfit, even down to the lapel pin. Voila! 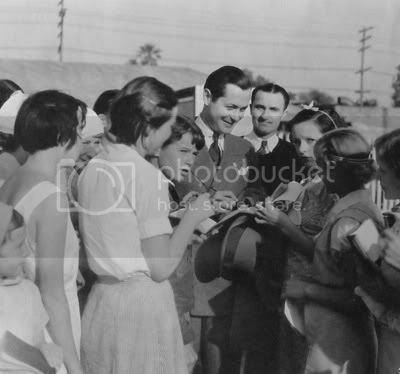 So we have pictures of a group of fans mobbing Bob before getting on the train to go to New York where he participated in an NRA publicity stunt, all taking place in August, 1933. I'll bet the pin has the NRA Eagle on it! Two pictures identified, many more to go.